matched scabbard, crafted from wood and wrapped in black leather, also adorned with ornately engraved, matched brass fittings. Overall 17 3/4" long W/Scabbard 23"
topped with military regulation Queen's crown pommel over a black basket-weave stud-worked hard wood shaped hilt. A.Scottish Dirk Flat- Traditionally, a blade such as this Flat Scottish Dirk would have been worn and carried by a member of the Highland Regiments. Once, it would have been a side-arm, but today, it serves mostly as a ceremonial weapon to complete the iconic Highland attire. This dirk is, a bit more flat in design the most, featuring a rounded, carved wood handle, reminiscent in shape of the Thistle (Scotland's floral emblem). The dirk features a one-sided, triangular blade of hand crafted steel, plus brass accents on the hilt of the dagger. Included with the blade is a matched scabbard, crafted from wood and wrapped in black leather, also adorned with ornately engraved, matched brass fittings. C.Scottish Dirk Knife- Styled after military regulation dirk and much favored by Scottish Bandsmen, this impressive 18" full size Scottish Dirk has a polished 12" steel blade etched with traditional Scottish thistle and foliage decoration. A black leather covered scabbard, capped with nickel mounts, chiseled in high relief, topped with military regulation Queen's crown pommel over a black basket-weave stud-worked shaped grip. The Scottish dirk (also "Highland dirk", Scottish Gaelic: Biodag) is the traditional and ceremonial sidearm of the officers of Scottish Highland regiments. The development of the Scottish dirk is a modern continuation of the 16th-century ballock or rondel dagger. The traditional Scottish dirk is a development of the second half of the 17th century, when it became a popular item of military equipment in the Jacobite Risings. The 78th Fraser Highlanders, raised in 1757, wore full highland dress uniform;their equipment was described by Major-General James Stewart in 1780 as including a "musket and broadsword, to which many soldiers added the dirk at their own expense." The modern development of the Scottish dirk into a ceremonial weapon occurred during in the 19th century. The shape of the grip developed from the historical more cylindrical form to a shape intended to represent the thistle. Fancier fittings, often of silver, became popular shortly after 1800. The hilts of modern Scottish dirks are often carved from dark colored wood such as bog oak or ebony. 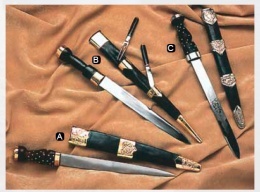 Hilts and scabbards are often lavishly decorated with silver mounts and have pommels set with cairngorm stones. This page was last modified on 23 June 2014, at 19:35.